The Himalayas stretch east into southern China, through Yunnan province, and along the border with India and Myanmar, sliced up by river gorges two miles deep. Victorian plant hunters ventured into the eastern end of the Himalayan range, bringing back rhododendrons, orchids, irises – and stories of battling with blizzards over mountain passes and descending into hidden valleys untouched by man. Higher than the Alps or the Rockies, these valleys are warmed by air that flows up deep gorges like central-heating pipes, creating pockets of life that seem to defy the mountains. In what is now the Baima Snow Mountain Nature Reserve, those early travellers found a riot of life, where bamboo grew, flowers opened, birds sang and strange creatures, almost human, were spotted in the distance, eating the lichen that hung from the trees like candy floss. In the 1960s a Chinese expedition, using yak and mule trains, spotted these Yunnan snub-nosed monkeys, living quietly among the trees, cut off from the world by peaks 22,000ft high. But it was not until the 1990s, when a Chinese film-maker, Xi Zhinong, spent 12 years battling to photograph them, that we learnt more about their habits and the way they have adapted to life above the clouds. His images and footage show a creature that looks quite unlike any other. The adults have flowing black and white coats, neat noses and the kind of puffed-up pink lips that would have made any plastic surgeon rich; their babies have pointed Yoda ears. Yet it is their character, shaped by their extraordinary high-altitude home, that sets them apart from other monkeys. Only a handful of troops of Yunnan snub-nosed monkeys remain, each comprising dozens of families, like a nomadic tribe. Each family has a male supporting a handful of females and their young. In winter, the central-heating system from the tropics turns off, and life is hard in the thin air. Few babies are born and several adults are needed to look after each youngster. The local Yunnan people do the same: it is usual for one woman to marry two brothers, polyandrously, as a husband and wife team alone can’t provide enough for the family. The snub-nosed monkeys’ family-based society is rare in non-human primates. They survive by working in concert, feeding on usnea lichen through the winter and huddling together for warmth. In summer, they eat flowers, leaves and insects. Lichen gives little energy. Monkeys don’t hibernate, and they can’t head down the mountain to warmer valleys, where the lichen on which they feed doesn’t grow. Scattered under the snow are huts built by Tibetan Buddhist monks. For a few months in summer, the snow melts, the huts emerge and the monks bring their yaks up to mountain meadows, where they make high-calorie yak butter. Few people on Earth live higher than the monks or the monkeys, and both seem to have a philosophy of kindness. 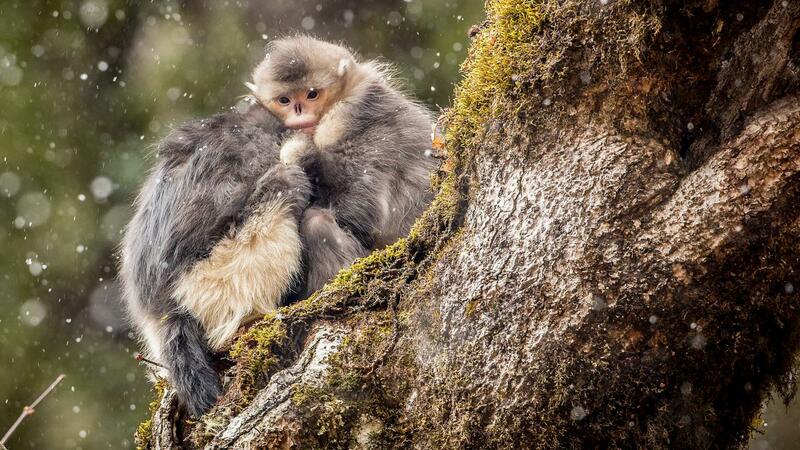 Yunnan snub-nosed monkey families are friendly. The females act as community midwives, and even when troops meet, they are rarely violent. Other monkey species have been observed to form increasingly co-operative societies the higher up the mountain they live. But Yunnan snub-nosed monkeys are exceptionally peaceful. They are a rare example used by scientists to demonstrate kindness or altruism in animals. It makes intuitive sense that hardship fosters co-operation. The mountains themselves, the cold and the snow, even the trees and the plants, mould character. Buddhists believe that the peaks and rivers are gods, controlling lives and thoughts. For a Yunnan snub-nosed, pink-lipped monkey in the Baima Snow Mountains in Yunnan, it seems they are right.